Furry Cat Designs - Karen Henderson - independent UK Stampin' Up! 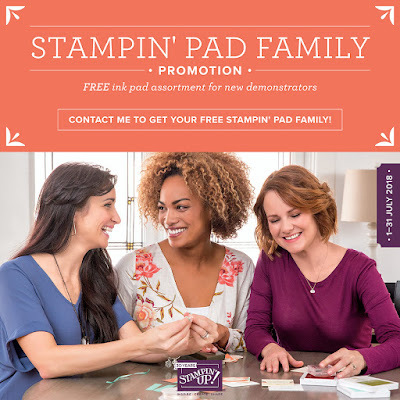 demonstrator: A Special Offer when You Join the Stampin' Up! family during July. A Special Offer when You Join the Stampin' Up! family during July. This is an extra blog post to tell you about a very special offer when you join Stampin' Up! during July. 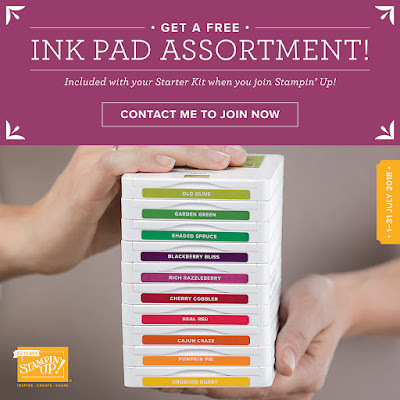 In addition to the Starter Kit you can choose an assortment of Classic Stampin' Pads for FREE! A Starter Kit is always fabulous - for £99 you choose £130 products from the catalogue with FREE shipping. During July, in addition to the Starter Kit, you can also choose an assortment of 10 coordinating ink pads from one of the following colour collections: Brights, Neutrals, Regals, Subtles, and 2017–2020 In Colors.